Join one of our knowledgeable captains on our Cape Lookout tour located on South Core Banks. Leaving from Beaufort, they will take you around the local islands giving interesting facts along the way about where you are and what you might see. Cruising down the shore of Shackelford Banks, you might catch a glimpse of the wild banker ponies that inhabit the island. 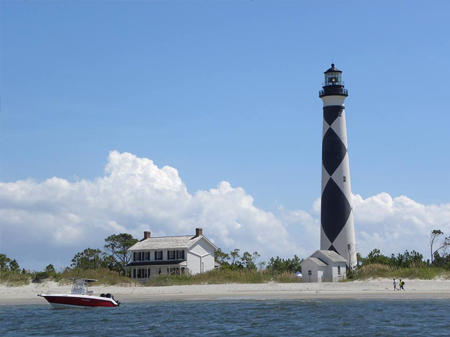 Passengers will cruise by the Rachel Carson Reserve and see the Cape Lookout Lighthouse on this tour. Passengers will land at the Harkers Island to learn about the history of the island and will have the opportunity to use the restroom facilities. Dolphins frequent these waterways, as do a variety of sea turtles, so keep a sharp eye on the lookout! Contact us today to make a reservation.